In the present day society, adolescents ,youth,women and girls find it hard to talk about help, issues related to NCDs ,addiction, trauma, domestic violence, mental health etc. We believe that talking about feelings, trauma asking for help is still a taboo and highly stigmatized and further biggest barrier in effective service delivery at grass root level. The idea of forming Nada Acudetox India Network was mooted by Nada India to achieve the objectives of promoting barrier free health delivery services among marginalized.Nada India encourages Community Wellness for Behavioral Health including Addictions, Mental Health, and Disaster & Emotional Trauma. Dr. Michael O’ Smith, psychiatrist and acupuncturist said “NADA Acupuncture teaches us to relax from the inside out.” This increased sense of calm and the quieting of symptoms that occurs as a result of the acupuncture treatment stimulates one’ own “Qi”( one’s inner energy) and brings us back into a more balanced state and chance to communicate. As we become calmer inside, we become much more aware of over selves and others. You can also read about NADA helpful resources here. Are you looking for NADA Acupuncture Detoxification Specialist (Acudetox Specialist ) in India or next ADS training or hoping to add NADA protocol into your existing prevention, wellness ,addiction treatment or rehabilitation facility or behavioral health program? Indian Association of Acupuncture Detoxification Specialists is committed to ensure that the training and certification of Acupuncture Detoxification Specialists meet clinical and ethical standards. The NADA protocol is an adjunctive formula tool that can be incorporated into any treatment modality for substance misuse, stress reduction , wellness ,trauma and associated issues. It is designed for those who are already working in the stress reduction service, addictions treatment services, trauma center or who want to add to their knowledge and provide other treatment options for their clients. This course is a blended learning experience – theory, practical, group work, ongoing assessment, individual examinations, continuing clinical and professional development and sustained membership. If you are a candidate working with clients who have, trauma, stress and substance misuse issues and you work within a supervised treatment setting then you may be eligible to do the NADA India training (IAADS approved). For example, we have trained candidates with a variety of roles within the De-addiction centers ,Prison Service, Mental Health Trusts, Probation Service, Community Drug and Alcohol Teams. These range from outreach workers, needle exchange workers, nurse specialists, doctors, prison officers, probation officers, physiotherapist etc. Every trainee must complete the combined didactic and clinical experience provided and/or overseen by a Nada Trainer. In addition, he or she will demonstrate to the satisfaction of that Nada Trainer a mastery of the basic competencies. Upon successful completion of all requirements (hours and competencies) and an application process, the ADS will receive a Certificate of Training as an Acupuncture Detoxification Specialist/Associate/Assistant Occasionally applicants are not able to demonstrate the required competencies even upon completion of the required hours of training. Such applicants will not be eligible to receive a certificate until they do so. Individuals may work with a Registered Trainer/supervisor to identify deficits and, in partnership, create a plan that will allow the individuals to achieve appropriate mastery of the materials and techniques. The Training Completion Certificate indicates successful completion of NADA acudetox training and demonstration of entry-level skills. NADA does not provide initial or ongoing certification of ADSes. ADSes are encouraged to maintain competencies and continue to expand their knowledge by pursing continuing education, attending the NADA annual conferences and maintaining active annual membership in the organization. ADSes each sign an Ethics Pledge verifying the understanding of and agreeing to abide by rules regarding limited scope of practice as appropriate, confidentiality, client rapport and respectful treatment, financial interest, and sharing experiences with the NADA community. NADA asks that each trainee complete a membership application at the onset of training. This membership, good for one year, entitles trainees to all the benefits of membership including the newsletter. Upon successfully completing training requirements and demonstrating mastery, the Registered Trainer will submit the trainee’s completed application for the Certificate of Training as an Acupuncture Detoxification Specialist/Associate/Assistant to the Nada India office, signed by the Registered Trainer, along with the trainee’s signed ethics pledge. Read more about ear acupuncture and addiction treatment in India. Click here to participate in acudetox training or read more about Acudetox India here. Click here to read about Nada Ear Acupunture. Nada India promotes two basic approaches one is the use of ear acupuncture at all stages of addiction treatment & rehabilitation and peer based interventions. NADA protocol was developed and spearheaded as a worldwide movement by Dr. Michael O. Smith Psychiatrist and Acupuncturist from New York the Founder of National Acupuncture Detoxification Association. News updates from IAADS bi-monthly newsletter (Updates by email of current events and news ) exclusively devoted to recovery and healing from addictions, trauma, and other behavioral health issues and world wide NADA movement. Discounts on the annual workshop/ conference. Listing on acudetoxservice.blogspot.com of all registered ADS that provide Acupuncture Detoxification Specialist services. Support in starting a new program, advice on how to help maintain a program, and assistance in contacting other NADA professionals who can provide invaluable consultation and guidance worldwide. You can click here to participate in Acudetox Training Process. Please send an email request at nadaindia@gmail.com along with filled form. Promoting and advocating the understanding of the problems and issues faced by health professionals, Counselors, peer counselors who acquired training as Acupuncture Detoxification Specialist (ADS) as per the NADA protocol. Advancing education and research in the field of Holistic health, Ear acupuncture (NADA protocol) and addiction treatment, rehabilitation. Promote and advocate the professional needs of Acupuncture Detoxification Specialists (Like addiction counselor, peer counselor ,social workers and correction officers , physician and mental health professionals etc.) 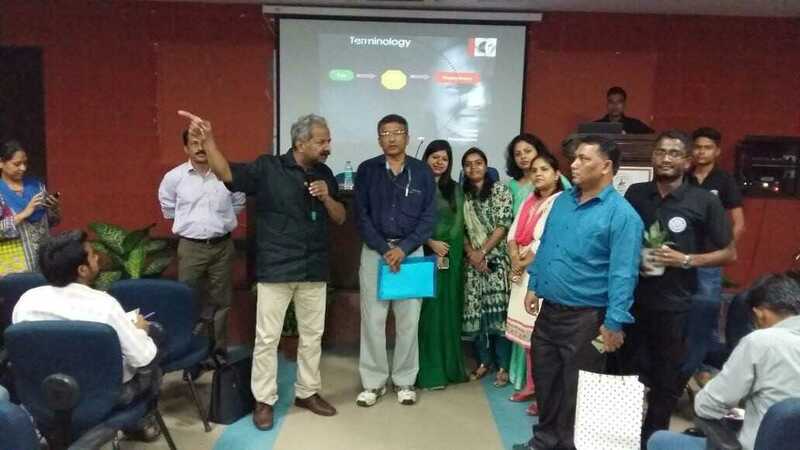 trained and certified as per the norms set by National Acupuncture Detoxification Association ( NADA) especially those working in the Government ,peer led rehabilitation centers, private and other non-governmental organizations. The Trust will undertake initiatives in the areas of ethics, regulatory system, govt. policy vis a vis ADS, accreditation of CME programs, treatment guidelines & data bank related to ADS and their training. To maintain a register of ADS trained and certified as per NADA norms and guidelines. Read more about the Nada newsletter here. Developed in the 1970s at Lincoln Hospital (Bronx, NY), the National Acupuncture Detoxification Association (NADA) protocol was originally used as a supportive component in drug and alcohol treatment settings. The 3-5 point ear acupuncture formula controlled withdrawal symptoms and helped patients become more clear-headed and comfortable. Nearly 1,000 licensed drug treatment programs use acupuncture in the U.S. according to federal N-SSATS statistics. The 21st century has brought a remarkable expansion in the use of the NADA protocol. It is used in 130 prisons in England. Correction officers provide all the treatments under a 5 year training contract by Smart-UK. The jail program was expanded because of an 80% reduction in violent incidents. Post-trauma treatments have been given to community members after 9/11 and Katrina. Treatments for firemen have been permanently institutionalized in both cities. Ear acupuncture for stress has been used by thousands of para military ( Border Security Force) personnel in India through NADA-India. NADA acupuncture has changed the face of psychiatric hospital care in Northern Europe. 3,000 nurses have been trained in 100 different government facilities. Refugee services in war-torn areas have been particularly impressive. The DARE program in Thailand has provided ear acupuncture for many years with a dozen different Burmese tribes in border camps. NADA was introduced during a 2 week training sponsored by Real Medicine Foundation in refugee camps in East Africa in May 2008. By the end of the year, 18,000 treatments were provided by the refugee trainees. Support was provided for survivors of a violent land dispute. NADA members have used magnetic beads to treat children with ADHD and autism-spectrum disorders, and violence-prone adolescents. The beads are placed on the back of the ear opposite the shen men point. Bead remains in place with and adhesive 1-2 weeks at a time. Many instance of prolonged improvement have occurred, but this technique is only in an early stage of evaluation. NADA acupuncture is used on a public health model. Treatments are commonly given in large groups on a frequent basis. Patients sit quietly for 45 minutes in a collective experience. Many jurisdictions have laws that allow a wide range of clinical personnel to be trained to use the NADA protocol in state approved facilities under general supervision of a fully licensed acupuncturist or physician. States that do not have this provision, such as Florida and California, have few NADA programs in comparison with states like Virginia and New York which do have this arrangement. NADA uses 3-5 ear acupuncture points: sympathetic, shen men, lung, liver and kidney. In many settings only the first 3 points listed above are used. Results seem to be similar with 3 points, and there is less expense in Third World settings. NADA training also involves sterile precautions and social integration with other services. Apprenticeship training is always necessary because the clients are often troubled and distracted. NADA is a non-verbal approach. There are no diagnostic procedures. The ear points provide a balancing effect: some fall asleep; some feel relief of depression; some seem to be meditating. These balancing effects continue from one to several days even though the patient may be exposed to contrasting emergencies during that time. It is a coping and preventive effect. As an added note, Lincoln used electro acupuncture extensively in the 70s. Symptom relief lasted 6-8 hours. Our patients always preferred the prolonged preventive effects of manual acupuncture. NADA acupuncture adds a valuable component to the behavioral health fields. Its worldwide validation strengthens the entire acupuncture profession. Click here to take the pledge. Late Dr. Michael O. Smith, Founder NADA. Are you looking for NADA Acupuncture Detoxification Specialist (Acudetox Specialist ) in India or next ADS training or hoping to add NADA protocol into your existing prevention, wellness ,addiction treatment or rehabilitation facility or behavioral health program? Drink Revolution pre-launch party @ARSD College in Collaboration with NISD SENSITIZATION PROGRAMME PREVENTION OF DRUG ABUSE AMONG THE YOUTH About 170 students participated in this training programme. Participants were from Ram Lal Anand College ,Aryabhatta College, Maitreyi College, Rajdhani College, Kalindi College, P.G.D.A.V College and A.R.S.D College. The First Session was taken by Suneel Vatsayan, founder and chairperson of NADA India Foundation. He is an avid researcher, philanthropist and blogger who has been associated with IOGT International for more than three decades. He is actively engaged in the field of sensitising adolescent community in the slum, villages, schools and colleges on various issues like HIV, NCDs, alcohol/ drug abuse and violence. His session was very interactive and lively which included examples that established a very good rapport with the audience. He also shared his experiences of working with drug users and people afflicted with non communicable diseases (NCDs) and peer education work with undergraduate students of various disciplines. He explained in details the terminologies associated that are use, misuse / harmful use, abuse, dependence, addiction and detoxification. He began his session with an experiential exercise on identifying any one disease that any of the family members had and the coping mechanism of family members during those times. He remarked that the past mistakes are meant to guide us in future. It is in this context he talked about drug de-addiction so that students could empathise with the situation of family members of drug addicts. He stressed that language of recovery must be used in such situations so the word addict should be replaced by drug dependent. He discussed the reasons that make the youth more susceptible to drug abuse. The adolescent within youth battling with identity crisis, need of privacy, curiosity, mood swings, peer pressure sometimes resort to drugs as a means of relaxation and before they even realise they fall in the vicious cycle of addiction. Drugs become peace at any price as they provide reliable escape from personal consciousness and risk of unpredictable pain; addiction is a disease of “more”. A majority of youth fall into this trap unknowingly hence it becomes very important to treat them. The treatment of drug abuse and recovery process begins with management of chemical symptoms of withdrawal and craving. This is followed by providing safety, social support, education about addiction, basic issues of personal growth. The role of family and society in the second phase becomes very important. He coined “Tough Love” as the best description of treatment strategy. Its a seemingly impossible combination of strong discipline and unquestioning support. “Tough Love” is part of any parenting or teaching effort. The different steps in the detoxification process were also discussed. In the end he remarked that the strong will power to recover plays a very important role in the process of recovery. He concluded his talk by discussing how NADA foundation is dealing with this problem existing in our society by the technical assistance programme it runs.